The sixties saw the emergence of a very different sort of novel about spies from those written by Ian Fleming. The writer was David Cornwell, who used the pseudonym John le Carre, since he was working at the time for MI6, the foreign branch of British Intelligence. He had previously been in MI5, which was for counter-intelligence, and for which James Bond supposedly worked. Before that he had taught briefly at Eton, though he had not been a schoolboy there, unlike Fleming, whose credentials as a member of the British establishment were much stronger. Le Carre’s principal hero was George Smiley, the very antithesis of James Bond. He was totally without glamour, and based in part on V H H Green, the rector of Lincoln College in Oxford where le Carre had studied. Wrapped up in Smiley’s successes in counter-intelligence are his personal failures, notably a disastrous marriage, with his wife being seduced by a colleague who turns out to be a Russian agent. The unmasking of that agent was the subject of Tinker, Tailor, Soldier, Spy which brought le Carre into British drawing rooms through a brilliant television series, starring Alec Guinness. Earlier le Carre had won cinematic fame through The Spy who came in from the cold, with Richard Burton as an idealistic agent who realizes that the Communist he had thought his great enemy was actually a double agent working for the West. That ambiguity, the presentation of Western intelligence efforts as similar to those of the Communists, marks le Carre’s work, in sharp distinction to the black and white world of Ian Fleming and most popular spy stories. In The Honourable Schoolboy, the second book of the main Smiley trilogy, when Smiley runs MI6 and pursues traces that the double agent Haydon had concealed, the crux of the plot is the determination of the Americans to push aside the British and take over the Chinese politician Smiley had so cunningly entrapped. Smiley is not helped by his British colleagues who have decided that Britain is incapable of any independent role, and who bind themselves and their service over to the ‘Cousins’, as the Americans are called, in the process advancing their own careers. With such a perspective, it was not surprising that, in the last few years, le Carre has become aggressively critical of the thrust of Western militarized foreign policy. The thrust of his attack however is one that can be appreciated even by those who accepted the need for a forceful response to the attack on the Twin Towers, since it describes as ‘one of the great public relations conjuring tricks of history’ the fact that ‘Bush and his junta succeeded in deflecting America’s anger, from Bin Laden to Saddam Hussein’. He is cynical therefore in his accounts of how the Americans create Islamic extremists to justify extreme measures against them. He had done something similar in The Tailor of Panama, which is reminiscent of Graham Greene’s Our Man in Havana, in its description of how a bumbling agent precipitated a crisis. In le Carre’s world however the bumbling is encouraged by the American controllers, who are desperate for an excuse to invade. 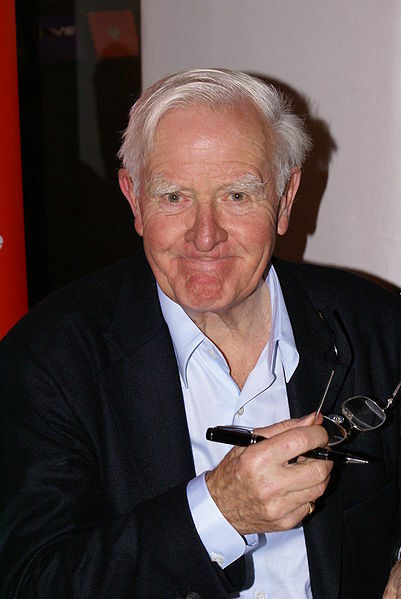 Sadly, recent accounts of the use made of ostensibly independent media outlets to relentlessly target unpopular regimes, so as to justify intervention and military action, suggest that le Carre was wrong only in underestimating the capacity of players of the great game, whatever side they are on, to use trickery and treachery to achieve their ends. Le Carre’s understanding of such trickery was based however in personal experience, for his father had been a conman of some distinction. This led to one of his most subtle works, A Perfect Spy, which describes the development, in part as a reaction to a father who let him down repeatedly while continuing charming, of Magnus Pyke into a double agent. Nevertheless, as noted above, le Carre’s great hero is the stolidly loyal George Smiley, with Bill Haydon, who seduces his wife, and who was based on Kim Philby, another man with a chequered home life who went over to the Soviets, being clearly unpleasant. His come uppance is very British, for he is killed by his Oxford fellow student, who had adored him and trusted him enough to follow him into the Secret Service. Though Bill had made sure his protégé was saved, he had had no compunction about allowing the Soviets to arrest and destroy the agents for the West whom the protégé had nurtured. So, when Bill is finally unmasked, and placed under arrest, his protégé kills him – though even there we find an element of ambiguity, for perhaps this was better for Bill, saving him from further interrogation and betrayal of his Soviet links. Personal loyalties play a great part in le Carre’s world, as in Our Game, when an old Etonian decides to stand by his Chechnyan friend from Eton, even though the government officials who had encouraged his radicalism had abandoned him. Something similar occurs in The Night Manager, when a minor spy finds that his masters in Whitehall and in the Foreign Service are playing ball with arms dealers, but manages singlehandedly to save his friends. Bitterness about what le Carre sees as the double-dealing of the ruling class is most forcefully expressed I think in The Constant Gardener, about the havoc wrought by multinationals in Africa, and the support provided for them by a Foreign Office that has been transformed into a sales agency. The book is a salutary reminder that, while we may welcome the current new thrust of British Foreign Policy, away from the sanctimonious interference of the Labour government, ruthless commitment to commercial goals can also contribute to interference of a different sort, to keep in power regimes that follow (and place) orders. Within all this however le Carre also has beautiful portraits of old style public servants trying to behave honourably, the Permanent Secretary in The Night Manager who refuses to be bribed, but simply walks (or rather cycles) away from a meeting at which principles are abandoned, the High Commissioner in The Constant Gardener, who retires to grow roses, leaving the Mission in the charge of his loathsome commercially oriented subordinate. But, sadly, such idealists lose out. Le Carre’s world then is full of such quixotic gestures, some of them leading to tragic deaths. I recall still Richard Burton, refusing to escape on his own, and shot on the barbed wire fence as he strives to get Claire Bloom over too. And, though it was never filmed, I recall the last lines about the honourable schoolboy, lying dead as the Americans whisk Nelson Ko away, so that we even feel sorry for his ruthless brother Drake, the Hongkong magnate who had been so smartly outplayed by Smiley – ‘Soon there was once more no sound but the surf flopping on the beach and Drake Ko’s hopeless, choking grief against the victorious armadas of the West, which had stolen his brother and left their hard-pressed soldier dead at his feet’. Le Carre’s world then is a bleak one, unlike those of his predecessors in the genre, Buchan and Fleming. But he does I think make us better understand the issues that are involved, the need to make choices but also never to lose sight of moral perspectives, in trying to achieve laudable ends.